I took action today and conquered one of my fears. but I decided that I was going to embrace the courage. I got on and just decided I was confident. I an so glad I took action! What have you been doing to take action? Comment below or e-mail meg@soulfulbrilliance.com. You could inspire someone else to have COURAGE! Ever had a time in your life when you felt discouraged about your life? Knowing that you can do so much, but being afrad to do it? Well, this last few months I have been struggling with that fear. I keep asking myself why I have gotten so off track. I know so many tools to help myself create my best life. There was a simple answer...I've been letting my fears paralyze me. Today I had a little inspiration come to me! How do you find your Soulful Brilliance and live the life you desire? If all you do is wish. If all you do is dream. If all you do is think about what you want. You will feel stuck in life. You will be unhappy, miserable, and depressed. The key is to ACT! Learn to have faith in and trust in yourself and your Father in Heaven. Feel your fear and acknowledge it, but push through it and move on! Move. Act. Take a step in the direction you want to go. Remember even small steps mean you are moving! It can feel terrifying at first...to walk a new path. To leave the comfortable, familiar path you know. You may fall, but you can get back up and move on. You may come across an obstacle, but you can find away to go around it. Before you know it you're walking faster. You are walking with confidence and power. You are radiating love and light. Does it happen all at once? No! It comes a little at a time. The light and divine potential that you always have carried inside! You find the courage to walk despite your fear. You find that Heavenly Father has always been leading you in your path. He has always been walking right next to you. Pleading with you to find your gifts and use them to help others. Smiling when you discovered all you can do! ACTION will take you to where you want to go! 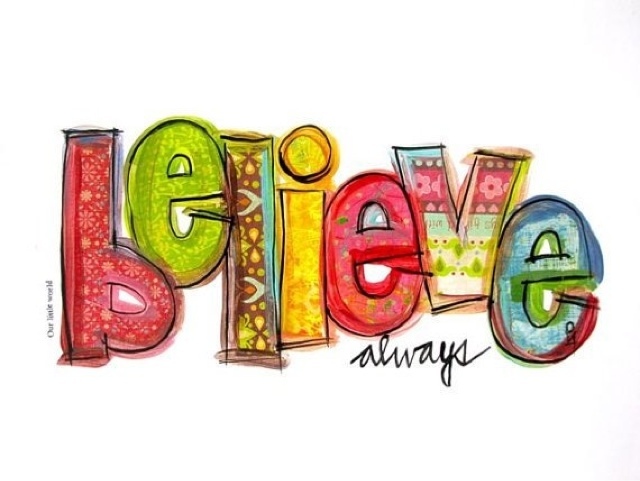 Believe means "to be love." is the next step in our journey. Over the last week or two, we have become more aware of our limiting beliefs. Now let's talk about how we can shift them to be EMPOWERING beliefs. Are you ready with your journal? Look back at your list of beliefs and choose one. Write it at the top of a page. that you have when you live with that belief. I can't be myself because I'm not perfect and others won't accept me. -I don't treat myself well and by doing this give others permission to not treat me well. -I feel depressed, tired, sluggish, and old. -I am disconnected from my Heavenly Father when I don't feel worthy and struggle doing the little things to keep His Spirit with me. -I spend a lot of money on clothes that fit, self-help books (that don't really help), and candy and junk to eat when I feel all those negative feelings. -Ultimately I will fall into a downward spiral and never have the peace and happiness that my Heavenly Father wants to bless me with. evidence from your life that shows that it is not true. So I wrote this, "I am a beautiful daughter of God. My old body was the creation of my insecurities and untrue beliefs as I would eat to fill a negative feeling. Heavenly Father doesn't make ugly things! I am worth a lot to Him! My Savior suffered and paid the price for my sins as well as my afflictions, heartches and pains. I'm so important to Him, so I should value myself as He values me." After writing all this down I made a commitment to change. NOW is the time to change!! doesn't accept myself and that I am the perfect me I can be. -I am a beautiful, amazing woman capable of hard things and worth more than rubies. -I am worthy and deserving! Write down your new empowering beliefs! all the amazing wonderful things that you are capable of! He is the one who is feeding you these limiting beliefs. All Heavenly Father wants is for you to love and trust in His plan for you. If we are living in fear we aren't living in faith As we learn of and embrace the power and love Heavenly Father placed within us, and as we recognized the we have an intelligent mind that can assist us in making wise decisions we truly begin living in faith. 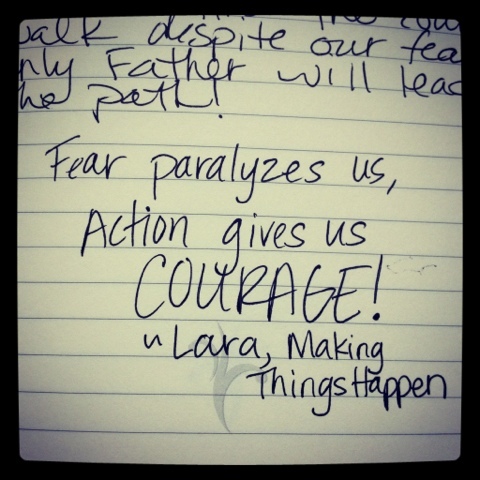 when fear shows up in our lives we are able to say, "Father, I have faith that you will guide me in my life." With a prayer in our hearts, we can recognize our fear for what it is: 1) Satan trying to get us off our path, or 2) Heavenly Father trying to guide us to our path. We shift that fear into faith because we know and understand that we are powerful divine beings, full of love and possessed of a sound mind that is able to recieve revelation and knows that our lives are truly in the Lord's hands. As we live righteously doing all things He would have us do, He will assist us in our path, helping us through trials, guiding us to others that need our specific gifts and talents to help them in their lives. True faith includes faith in ourselves as children of a Loving, Merciful Heavenly Father! He gives us unique talents and gifts so we can bless the lives of others, which will also bless us with peace, joy and freedom. He gave us power, love and a sound mind to assist us in fulfilling the measure of our creation. We are divine beings full of Love and Truth. If we truly believe this NOTHING can stop us from doing the Lord's work. Remember to BELIEVE IN YOURSELF (love yourself)! Please share your thoughts and comments below or email them to me at meg@soulfulbrilliance.com. Maybe your story will help someone else find the courage to live in their SOULFUL BRILLIANCE! the secret of living a happy life. What if I told you that YOU are that secret? decides if you will be happy or not. Well, let's go back to our beliefs that we wrote down on Thursday. One that I have struggled with is "I'm not good enough." How do you feel when you believe those things? like I can't do anything right. How do you act when you believe that thought? I would just not do things at all because then I couldn't fail. Look at your life and see what you do to prove your beliefs to be right. "See! It's true! I'm not good enough/I can't trust people!" in a way to fit them into proving to myself that my beliefs were true. act in a way that supported those beliefs. Did I consciously realize I was doing those things? I didn't realize how often I did it. people and situations that came into my life. so I kept on telling myself the same old story. I reached a point where I had a choice. It's the same choice you have right now! Are you going to keep living with those beliefs that make you unhappy? Or will you choose to shift those beliefs to create a life of joy, peace, and freedom? you can stop reading now and find something else to do. You have taken the first step to living your life! Pay attention to your thoughts today. See how many times you have a negative thought. A thought that proves one of your limiting beliefs is true. Ask yourself if that thought is true. you didn't have that thought? Record your thoughts and feelings in your journal. Check back tomorrow at 2:00 p.m.
for more on shifting beliefs! How are you doing with the mirror exercises? Anyone have a story they'd like to share? Comment below or e-mail me at meg@soulfulbrilliance.com. we hold about ourselves, life, people, and the world. finish the following sentences with as many answers as you can. Don't hold back, just write down the first things that come to mind. Look at your list of beliefs. When I first did this, all of my beliefs were pretty negative. myself, life, people, and the world too. your negative beliefs about yourself aren't true? beliefs about life aren't true? I'm going to do this as well. I am committed to posting again on Saturday by 11:00 a.m.
so we can live in our soulful brilliance!